Best Trick: Maury has an excellent balancing act. He can stand on his two back feet to reach for treats. Turn Ons: Maury loves when you scratch his head with your pinky finger. He also loves snuggling under blankets. He’ll go right to sleep. Turn Offs: Maury does not like belly rubs. Favorite Toy: Maury loves breaking open eggs with his mouth; it’s more of a game than feeding time for him. What makes your pet so special: Maury is such an obscure pet to have and is very misunderstood. Lots of people fear him or assume he has no personality because he is a lizard. 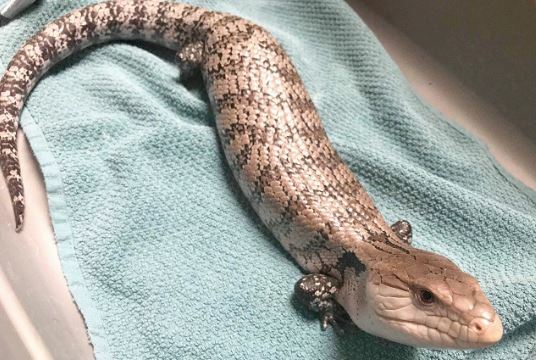 Blue tongued skinks are very affectionate towards their owners. They can recognize their owner’s scent, voice and even the vibrations of their footsteps! Maury is a great companion and very fun once you get to know him! Follow the EAST COBBER magazine on Facebook, Twitter and Instagram!